To keep residents updated on the latest happenings at the State Capitol, State Rep. Dave Yaccarino (R-87), along withState Sen. Len Fasano (R-34), hosted a town hall-style meeting at the Mildred A. Wakeley Community & Recreation Center. 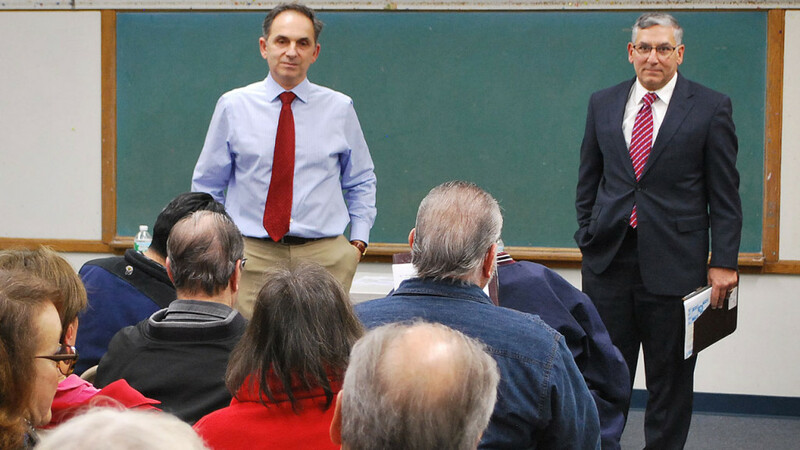 To keep residents updated on the latest happenings at the State Capitol, State Rep. Dave Yaccarino (R-87), along with State Sen. Len Fasano (R-34), hosted a town hall-style meeting at the Mildred A. Wakeley Community & Recreation Center on February 29. The North Haven lawmakers discussed the ongoing state budget crisis, including projections released last week by the legislature’s non-partisan Office of Fiscal Analysis that the State’s budget deficit of $72.2 million that was just announced last month has now increased to a staggering $266 million for FY16. Residents expressed deep frustration about the repeated annual deficits in the state budgets and the subsequent tax increases imposed on their families and/or business budget. Many of them shared stories about friends and businesses that have left or are in the process of leaving Connecticut because they cannot afford to stay. Furthermore, residents shared their concern of jobs leaving the State and citied General Electric’s move and talked about the ever-growing possibility of Sikorsky following suit. Residents discussed their views on what they believe to be contributing factors to the state’s fiscal crisis. “Connecticut is a great state, but clearly we need to change the direction we are heading if we want to reach our potential and build a better future for our families. Rep. Yaccarino and I are committed to getting our state back on track in these difficult times. Hearing from our constituents is an important part of the process so we can better understand what people in our state need to succeed and prosper. I thank everyone who came out to share their ideas and questions with us. I am always available to hear from you at [email protected],” said Sen. Fasano. Anyone who was unable to attend the event but would like to speak with their legislator may do so by contacting Rep. Yaccarino at 860-240-8700 or Sen. Fasano at 860-240-8800.